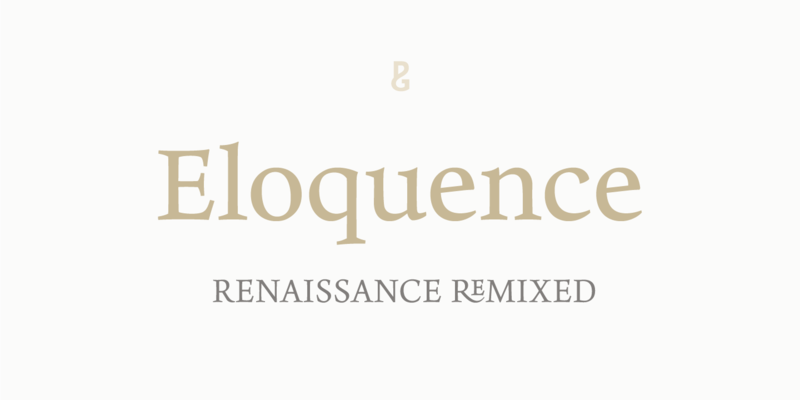 Eloquence is a modern typeface created and published by Paulo Goode. As its name suggests, Eloquence persuades by the vivid and graceful power of communicating the message. Inspired by the early stages in the production of printed text, this typeface combines these classical roots with modern characteristics (a high x-height, open bowls and counters, razor-sharp serifs and terminals). The clean and modern look gives excellent readability and makes it appropriate for a variety of projects such as advertising, posters, magazines, books and display work. The complementing discretionary ligatures and alternates are meant to act as decorative elements. This comprehensive typographic tool set aims to help you design better. A font description published on Monday, April 8th, 2019 in Fonts, Paulo Goode, Paulo Goode by Iulia that has 334 views.